According to liberal MSNBC anchor Chris Matthews, Supreme Court Chief Justice John Roberts being the fifth vote to strike down Obamacare would make him the "second Roger Taney," the Civil War-era high judge who delivered the majority opinion in the Dred Scott Case and upheld the Fugitive Slave Act. According to Matthews, Robert doesn't want to "do something so egregious as to strike down something that's passed with 60 Senate votes, with a majority in the House and signed by the President with the full mandate of the American people reflected in the election of 2008." 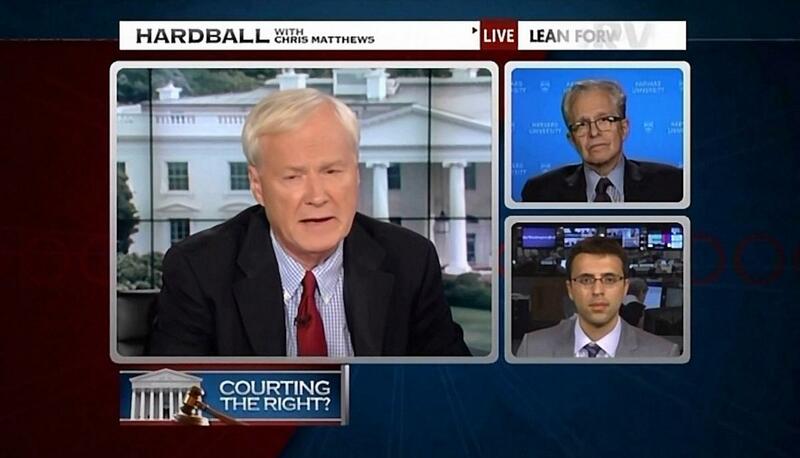 On Monday, the Hardball host mocked this "most conservative Supreme Court." He then made another historical smear, speculating, "I wonder whether this court would have backed desegregation in the Brown case? I doubt this pack of conservatives, which includes Chief Justice John Roberts, Sam Alito, and Anthony Kennedy, would have voted to knock down separate by equal back in the 1950s." CHRIS MATTHEWS: You know, one other concern here, Ezra, a friend of mine, who is a fellow Roman Catholic said, he doesn't want to be the second Roger Taney. Roger Taney, of course, was a Roman Catholic who upheld the Fugitive Slave Law back before the Civil War and was villainized throughout history because of that. That he doesn't want to do something so egregious as to strike down something that's passed with 60 Senate votes, with a majority in the House and signed by the President with the full mandate of the American people reflected in the election of 2008. To strike down something like that really does seem radical. My question to you is, do you think he suffers that same fear either of those fears that he is just too radically conservative- his court will look that far or he doesn't want to go down individually as the guy that struck this thing down? EZRA KLEIN: This is a- it is a big move here and I think he takes it seriously. On the other hand, I think you look at it from his perspective and it probably t looks somewhat different. Right? That he sees it, he comes out of conservatism. He has a lot of conservative friends, the conservative legal tradition the way it is pushing in this direction has been very, very strong. So, he probably also doesn't want to be a huge betrayal to his side, which now almost universally believes that he should strike down this mandate, that this is one of their biggest chances in a generation to limit the Commerce Clause.